Running a website is expensive and time consuming. The traditional way to offset the cost has been to run advertising on the site. Unfortunately, advertising doesn’t pay what it used to and definitely doesn’t cover the cost of hosting, let alone everything else involved. I am lucky because I have a wonderful team that write simply because they love writing. They don’t get much compensation for what they do here. They get press passes, the occasional opportunity to mingle with minor celebrities and artists, and they get their name out there on a respected news source. If you want to Support PopCultHQ so we can continue carrying on the legacy we inherited from Manny Popoca there are lots of ways to do it. the easiest it to keep reading our articles, sharing them with your friends, and occasionally clicking on an advertisement. 3. You can advertise with us! There are lots of ways to do it and we have the resources. We can run an ad through our social media network, give you a banner, or have us write an article about you, or your product. Just let us know what you are interested in and we can give you a price. Email us at reptile@popculthq.com for more information. We currently run one paid advertising article every Monday. 4. 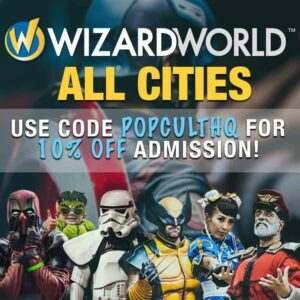 Use our code PopCultHQ for 10% off at ANY Wizard World Event. Using our code not only gives you a discount, it gives us a little bit of a kick back to keep this site running. 5. Make BitCoins, while getting us BitCoins. Sign up to earn BitCoins through our referral link and we can earn up to a 10% referral. See here for more information. UPDATE 12/22/17 – This was great while it lasted, and it might pick up again, but for now, I am not recommending them BitCoinGet. I however had luck with FreeBitco.in. I like the fact that you can earn a few random every hour and they also have a mining system that allows you to make bits when you aren’t using your computer. If you earn enough bits then you can even earn interest from them. 6. You can just give us a donation which will be greatly appreciated by all of us. You can contribute through Patreon or via Paypal. Unfortunately you can not claim these donations on your tax return. 7. Sign up with FuboTV to get all your favorite sporting events without paying the cable prices, even better you can now Stream CBS. Anytime. Anywhere. and while you watch you watch your favorite shows, PopCultHQ will get a $10 bonus.